Since I’m almost done with the semester, I took a trip to the used bookstore to celebrate and found some sci-fi treasures. I’ve been following Women In SF&F Month over at Fantasy Cafe, which made me want to pick up some more sci-fi novels by female authors. “The Quiet Invasion” by Sarah Zettel – Andrea over at The Little Red Reviewer recently reviewed “Fool’s War” by Sarah Zettel, which made me want to read it. It’s out of print, so I was hoping that I might be able to find a used copy. The used bookstore didn’t have it, but they did have this one! It’s about aliens that land on Venus. “The Speed of Dark” by Elizabeth Moon – This one is a Nebula-winner. It’s about a man with autism who is offered a cure, but must decide whether to accept it because it would change the way that he thinks and perceives the world. “Dinosaur Planet Survivors” by Anne McCaffrey – This one seems to be set in the same universe as Sassinak, which I enjoyed a lot despite it’s many flaws. Space pirates and dinosaurs make me happy. Anne McCaffrey is my go-to author for comfort reading, and this seems like something I’d enjoy. “Nimisha’s Ship” by Anne McCaffrey – This one is set in the same universe as the Crystal Singer trilogy. 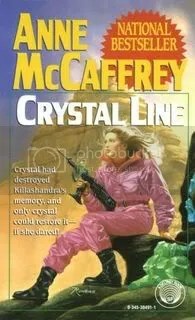 I’ll be reading both of the McCaffrey books a bit out of order, but I don’t think it matters because her stories tend to be able to stand alone even when they’re a part of a series. My copy of C. S. Friedman’s “Legacy of Kings,” the final book of the Magister Trilogy, also came in this weekend. I was going to wait to buy it till it came out in paperback, but it was on sale on Amazon a few days ago and I couldn’t resist. I’m not very patient when waiting for sequels. Has anyone read any of these, and if so, how are they? Have you gotten any new books lately? “Sassinak” is one of Anne McCaffrey’s lesser-known novels. It is co-written by Elizabeth Moon. I had never even heard of it before I came across it at a used bookstore, but hey, there were space pirates. What’s not to love about that? The book tells the story of Sassinak, who becomes orphaned as a child after space pirates raid her colony. She is sold into slavery, where she meets a man named Abe who tells her about Fleet and the values for which it stands. When she is finally rescued, she decides to enlist and dedicates her life to fighting the space pirates in order to prevent other children from suffering her own childhood fate. I enjoyed the premise of this book a lot (even though my boyfriend claims that the story is basically Metroid, which I unfortunately have never had the occasion to play). At the same time, the execution could have been a lot better. The pacing felt a bit rushed; Sassinak was orphaned, sold into slavery, and then rescued in the space of less than thirty pages. I wanted to spend more time watching events unfold and learning more about Sassinak’s thoughts throughout her adventures, and I wanted to spend a bit more time being introduced to the minor characters. I had to do a couple doubletakes because characters were introduced so quickly that I barely remembered who they were. I did love Sassinak as a heroine. One of McCaffrey’s greatest strengths is creating strong female characters who are career-minded and competent. Even while she’s in captivity, Sassinak manages to learn and excel at science and engineering. She becomes a skilled pilot, and once she joins Fleet she quickly moves up in the ranks to become a Commander. It was also pretty cool that the bulk of the action of the story took place when Sassinak was in her 40s. Overall, Anne McCaffrey’s other books are a lot better. 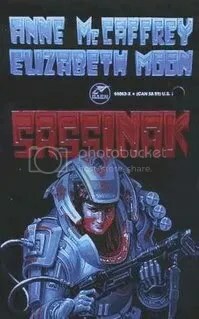 At the same time, if you enjoy space pirates, dinosaurs, and kickass female heroines, then you might enjoy “Sassinak” despite its shortcomings. I read this book as part of the Speculative Fiction Challenge hosted by Baffled Books. 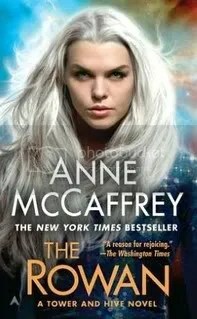 Although “The Rowan,” by Anne McCaffrey, is a science fiction novel, it reminds me a bit of a fairy tale. It just has that “once upon a time” magical feel to it. The story is set in a distant future where telepathy and psychokinesis have been scientifically proven to exist among a small percentage of the population. These individual Talents are used to transport goods and shuttles from one planet to another. A freak accident destroys a mining camp on the planet of Altair. One child survives who happens to have more Talent than anyone else on the planet, and every remotely sensitive person on Altair hears the psychic broadcast of her shrieks of terror and unhappiness until she is found. Known only as The Rowan, the child grows up and learns to develop her talent, eventually becoming the head of the Callisto space station. One day, she hears a psychic call for help from a guy named Jeff whose planet happens to be under attack by aliens. She and Jeff end up becoming involved in a cute interstellar romance while saving the world. While the book involves a romance, it isn’t an obnoxious one. I was a bit afraid that it would be when I picked up the book, mostly because of the terrible cover and the Harlequin-esque description on the back of the book. It wasn’t like that at all. The romance was secondary and was just a part of telling The Rowan’s story, and it seems to me that the publisher was trying to reach a demographic that would normally be intimidated by science fiction by playing up other elements of the novel. The more Anne McCaffrey books I read, the more I am impressed with her writing. She’s the kind of storyteller that makes you forget about your own surroundings and become immersed in other worlds, and at the same time her stories tend to be somewhat heartwarming and not at all depressing. I’d recommend “The Rowan” to anyone looking for some good escapist sci-fi. I read this book as a part of The 2012 Science Fiction Experience hosted by Stainless Steel Droppings and the Speculative Fiction Challenge hosted by Baffled Books. 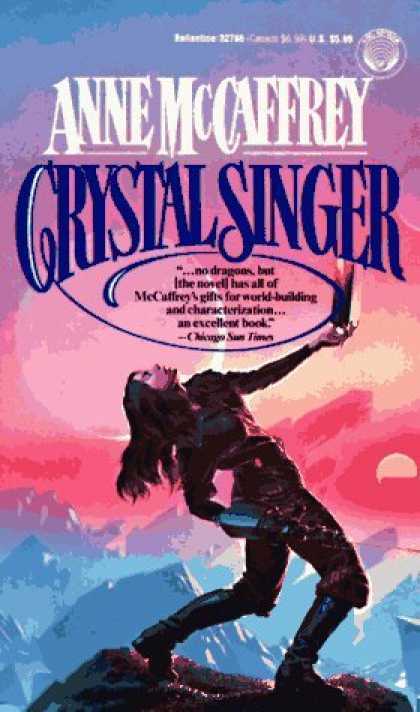 “Crystal Line” is the final book in the trilogy that began with Crystal Singer and Killashandra. It is unique among science fiction novels, as it features an aged protagonist. One of the risks to cutting crystal on the planet of Ballybran is memory loss. During the first two books, Killashandra was relatively new to singing crystal, so it wasn’t much of a problem. By the time that “Crystal Line” begins, there are noticeable lapses in her memory which progress as the book continues. The Guild Master sends Killashandra and Lars Dahl (her soulmate from the last book) to investigate a planet that appears to have similar characteristics to Ballybran. It was an intriguing mission, and the duo discover a sentient metallic substance that absorbs anything that they feed it. However, they very quickly realize that they are out of their depth and leave it to scientists to further investigate. After returning to Ballybran and to singing, years flash by as Killashandra experiences them. This was hard for me to read, and not at all enjoyable, as it reminded me of watching my grandmother’s deterioration from Alzheimer’s all over again. I realize that this isn’t any fault of the book, but rather my allowing personal experiences to cloud my reading. I couldn’t stop feeling awful for Lars, who managed to stay with Killashandra even as she became so forgetful as to not remember their relationship, and even though she pushed him away at every opportunity. Meanwhile, the old Guild Master killed himself, and Lars found himself taking over in his place, causing a further rift between him and Killashandra. Lest I depress you or dissuade you from reading, I will say that I was quite satisfied with the ending, which was happy. I like the fact that McCaffrey chose to keep focusing on Killashandra even as she lost her mind. That took talent, and you could still see her distinct personality as she kept assuring herself that she didn’t want to remember. It’s very interesting to read from the perspective of someone who is senile, while at the same time still being able to make sense of the story. Overall, I would recommend this. It’s a good conclusion to the first two books, and the parts that I disliked were solely because of my own previous experiences. It’s a well-written book; it just wasn’t good for me because of the subject matter. Even though I didn’t care as much for this one, the trilogy is still one of my favorites when it comes to sci-fi novels. This is the first book that I read on my new Kindle! I was going to wait until January to read this one so that I could count it for some of the upcoming Reading Challenges, but I couldn’t resist. I’ve done absolutely nothing today because I couldn’t put it down until I finished it. The only down side to not having a physical copy of this book is that I miss out on the Michael Whelan cover art. 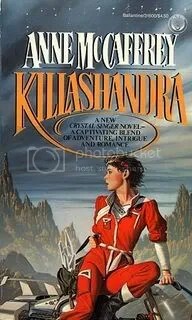 “Killashandra” is the sequel to Crystal Singer. In this case, I would advise reading the books in order, as McCaffrey doesn’t spend much time examining the events of the first book. The story picks up after Killashandra’s claim to black crystal was destroyed in a storm. She still has a crush on the Guild Master, but recognizes that he is taking personal risks because of his attachment to her. Desperate to get off of Ballybran before the Passover storms, Killashandra accepts an assignment to Optheria to install white crystal in an organ. It sounds like an ideal situation, as it will get Killashandra away from Ballybran even though she’s low on cash, and comes with a lucrative paycheck. However, all is not as perfect as it might seem on Optheria, and Killashandra is kidnapped, meanwhile uncovering a plot by subversives against a society that uses mind control to pacify its citizens. She happens to fall in love with her kidnapper, Lars Dahl, and must use her prestigious position as a Crystal Singer to help deliver justice to the Optherian people while protecting the man she loves. Oddly enough, I found Killashandra’s love interest in this novel to have a lot more depth than her affair with the Guild Master. Even though there might be a trace of Stockholm Syndrome in their relationship, Lars Dahl did have valid reasons for kidnapping her, and everything worked out rather well in the end. Killashandra is a strong female heroine, but there are times that her character comes off as a bit pushy and melodramatic. I think that her personality worked well in this novel, and she seems to have calmed down a bit since “Crystal Singer”–now she’s only bitchy towards people who fully deserve it, and it’s generally very satisfying. One of the things that I loved about both “Crystal Singer” and “Killashandra” is that although they are each part of a trilogy, the novels each have an individual resolution. This isn’t to say that I’m not chomping at the bit to read the next one, as I’m trying very hard to wait at least a couple hours before I put the next one on my Kindle! The protagonist, Killashandra Ree, reminds me a bit of Rachel from Glee. She’s very ambitious and driven, and it took me half the book to figure out that I actually liked her as a character. It’s been said that qualities that are seen in a man as ambitious are seen in a woman as bitchy, and I think that is true in Killashandra’s case for much of the book. The novel starts when Killashandra finds out that she’s never going to be the concert soloist that she’s spent her whole life trying to be due to a minor flaw in her voice. She gets angry and runs away from the school, having a brief affair with a man named Carrick. Carrick is a member of the Heptite Guild on the planet of Ballybran, and although he gets removed from the story almost immediately, Killashandra realizes that joining the Heptite Guild would be able to give her the same type of glory and prestige that she’d be able to have as a concert singer. The Heptite Guild are responsible for mining crystal that is used in communications. In order to mine the crystal, a Crystal Singer must have perfect pitch and be able to tune the cutter with the crystal’s resonance. Oh, and one other minor detail… in order to live on Ballybran, your body has to form a successful symbiosis with a spore native to the planet. Once it does, you can never be away from the planet for more than about a year at a time, or else you collapse into convulsions and die. If the spore doesn’t take properly, it can result in disability or death. If it does take, it alters your perception so you’re basically on a permanent acid trip. Oh, and crystal is addictive. Like, if you have adapted to the spore and are by crystal, you can just stare at it all day and be like “Oooh, pretty!” It’s apparently highly addictive and causes Crystal Singers to eventually lose their minds. Killashandra defies the odds and excels on Ballybran, and eventually falls in love with the Guild Master (and nerd that I am, I found this funny). One thing that I thought was really cool was the way that McCaffrey handled computers. This was written in the early 80s, but she didn’t use so much computer detail to make the book less relevant now that we actually have computers. Instead, she made their use primarily for data, and just said that the most important part of using a computer is knowing which questions to ask it. Another thing that I found interesting was the view of the economy. Killashandra’s home planet seems to be run in a quasi-socialist manner–the government does handle all monetary transactions/paying people, students get stipends and living accommodations for free (I am jealous), and people still get a measure of choice in their career paths. On Ballybran, things are run a bit differently. Since the planet is so secretive, the Guild is run a bit more like an 0ld-school coal mining company. Members have to pay for their equipment, training, etc., but then pay off their debt with their wages. However, as the Guild holds everything together, it doesn’t take advantage of the members, and you can get quite rich if you bring in the rarer types of crystal. Even if you’re in one of the lower positions in the Guild, everything is provided for you. All in all, a rather interesting read, and a good start with sci-fi for me.